This Review is Reposted here for Archiving purposes. Click here for where I originally wrote it. 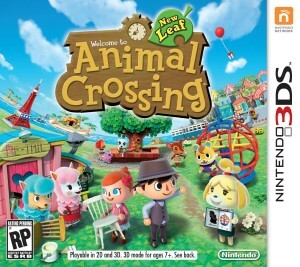 Animal Crossing: New Leaf is the next installment in the Animal Crossing series and the first for the 3DS. If you read my Anticipation Article, you will know I’ve been anxiously looking forward to the game. After playing for about a week non-stop, I decided to take a break (well, leave my game open and hope some of the villagers ask for new public works) to write up a review. The game features tons of new features and there were only a few I wasn’t too fond of. Regardless, I hope the series will continue in this direction with the future games in the series…although, maybe with less exclusives per region. Despite feeling a bit closer to the first (well, first that came to the US) Animal Crossing game for the Gamecube, there is an abundance of new features in the game that bring out the best in all three previous installments. While I’m sure some people will be a bit disappointed to see the flat land (and thus, less map options) over all the slopes in City Folk and Animal Crossing, there are still many different map styles and a slope down to your beach at the least. The game brings back the train station, island, Shampoodle, and Able Sisters’, but everything else has a bit of a twist. Gracie returns, although, you actually have to earn her store. Tom Nook has moved fully into real estate with his old store now being run by Timmy and Tommy. There is a new Recycle Center that features two new NPCs–Reese and Cyrus, the latter who will customize your furniture in all sorts of ways, and Kicks now has his own store selling not just shoes, but socks as well. The Museum, despite losing the observatory, does have a second story you can eventually get that includes four rooms you can use for your own exhibits. K.K. also plays every night once you build Club LOL (Although, his special live night is still just Saturday) and in short, most of the NPCs you know and love make a return with an even better upgrade. Even Katrina gets a shop, of course, hers will take a while to unlock. Which brings me to the biggest feature–you are Mayor. You get to decide a town ordinance, build facilities, and build other public works in your town. Unfortunately, you can’t cause villagers to move or even move their houses around or decide where villagers can move. This is especially frustrating because the game has removed the signs letting you know where a villager could move…this is because they can now move anywhere. Well, almost. They have to be a certain amount away from public works, other buildings, and edges, but overall, your flowers are no longer safe. This is also frustrating for anyone who wanted to prepare paths as you never know where a villager can show up. When you’re not mayoring it up in your town, there is quite a bit to do on the island. You can actually play various minigames to earn medals to purchase special items that are only sold there. Not to mention get a Marine Suit so you can dive back home as now that you can swim, there’s a whole bunch of new fish to capture from diving into the water. The events are a lot of fun and while there are some changes from previous ones, they are definitely still enjoyable and many I preferred even more so. 1. Fully expanding your house. 2. Getting the highest HHA expansion. Once you hit 150K for the main, you can unlock a special theme challenge to try and earn special gold exterior pieces. 3. Getting all the badges. There’s a bunch of different badges and three different ranks of each. 5. Filling your town with as many public works as you can (30). 8. Get all the moods! The graphics are great and while I admit I was a bit worried about the new taller characters at first (Felt they were kind of lanky), they really grew on me. Not to mention all the new clothing options they opened up. There’s tons of new hairstyles and you can even change your eye color now! Plus, for those who preferred the design part of things, besides being able to pick up to 30 Public Works for your town (don’t worry, facilities don’t count to this number), you can design shirts and dresses now along with being able to pick if they have short sleeves, long sleeves, or no sleeves at all. Hats (Round, Beanie, and Horned), Wallpaper, Flooring, and general patterns can also still be designed. You are even able to make your own color palette by picking 15 colors from a fairly large selection. Speaking of clothes, while you can’t make any custom designs for them, besides shirts and dresses, you also have pants, skirts, socks, and shoes along with the usual accessories and hats so tons of things to choose from to customize your character. And if you’re not that artistic and hated having to remake a pattern pixel by pixel, you will be happy to know that with QR codes, a new pattern is just a few snaps away :) Once you unlock the QR Code scanner anyway. Unfortunately, with the new quickness comes one bad addition–You can’t edit them or display them. Any pattern you scan through QR codes or make into a QR code can no longer be displayed at the Able Sisters or be modified in any way. So if you find the perfect dress in green and want it to be blue, unless the person who designed it is willing to do it, you can’t do anything about it. Anyway, New Leaf also features the biggest house yet with 6 rooms (Main, basement, Upstairs, left, right, and back) that can all be 8×8 and each room can hold up to 48 items plus the ability to put some furniture on walls. And not only can you update the interior, but the exterior as well :) You are able to change the little path in front of the door, the fence, the door, the mailbox, the roof, and the walls. You can even change your house’s style to something a bit more Asian, something more modern, or something with a touch of fantasy. Finally, there are tons of new fruits to plant around town and on your island. Not to mention you have tons of Public Works you can unlock to decorate your village with–several which can even be interacted with. There’s just so many choices plus tons of new items and options so everyone should be able to find something to enjoy. Animal Crossing: New Leaf features one of my favorite StreetPass features. More or less, anytime you StreetPass someone, their house will show up in the Happy Home area. You can then see badges they’ve earned, their dream address, and how their house currently looks. You can also order some of the items they have in their home (no more than 5 per day–this includes all the houses in the plaza). The house will update everytime you Streetpass the person and the more you Streetpass someone, you will eventually be able to get special items from them. The game is amazing. I have been writing and recording my day to day exploits and honestly don’t see myself stopping because I am enjoying myself so much. If you liked ANY of the Animal Crossing games–even if you only liked one and not the other two, get this one. It takes some of the best things in each game and it’s just really amazing. 1. Villagers can move anywhere. – This makes planning especially hard–if you wanted to put a Public Work inf ront of your house, for all you know, a villager could be there the next morning. 2. QR codes locking patterns. While I make a lot of patterns myself, I also sometimes use patterns others make. Unfortunately, I tend to be picky with shades and I can be a bit of a prude, so I often did little modifications to patterns. I also know many people who were not very good with designs and thus would use other people’s designs to put up for display in Able Sisters for themed towns. I feel that the speed the QR codes give takes a bit of the creativity and point of sharing away since you can’t really use patterns as well now with some of these restrictions. Not to mention it works both ways as if you want to make other colors of your design, but didn’t save a copy of it before you made it into a QR code, you also can’t edit it. 3. Splitting up the Police force – I love both Copper and Booker so the fact that I had to choose was really depressing. I wish both appeared at whichever station you chose. 4. I would’ve liked if I could’ve put more public works–but that’s just me. 30 is honestly a good number, although, I wish bridges counted as facilities so that whichever you added didn’t count towards the main number. 5. Some of the spaces away from things could be kind of annoying. I would sometimes find the perfect spot and it could fit… but since it’s not one space from the neighbor’s house, it can’t go there. I found that a bit disheartening. 6. So much to unlock. While upgrading is one thing, there are many places that you do not start with (For example, you can’t even see K.K. perform until you build the Club and the Club takes at least a week or so to even show up to be made) and some can take quite a while if you’re not prepared. Not to mention for those who may have started with City Folk where you essentially had all the shops to begin with, going to having very few can be a bit depressing. 7. This will never happen, but I do wish things were like the Gamecube version where they didn’t remove region exclusive items (You can still get them from other region towns of course! Just no way to access them by yourself unless you have multiple regions of the game). The Hinaningyo was one of my favorite items in Animal Crossing. Unfortunately, due to it being a region exclusive, I have never managed to get one since the Gamecube game. I’d love to see all the holidays and stuff be in each region of the game. I think it’d be a neat cultural experience. 8. I wish the items per room was unlimited. With 8×8 rooms, if you completely filled them, that would be 64 items. That doesn’t even count the fact that you can now put items on walls as well. I have always been pretty good at fitting in a lot of furniture while still being able to make it liveable. While 48 items is a huge improvement from the 20 that Wild World and City Folk had, I do miss the unlimited/as many as you can fit from the Gamecube game. 9. Public Works are a pain to unlock. Many are unlocked randomly through villagers and I’ve some people who have played for months and haven’t even gotten the Police Station requested. An alternate option over just praying a villager asks you to build one of the things you want would’ve been great. 10. No D-Pad use on the designs. I tend to get nervous easily so for me, being able to use the D-Pad for more precise moments than a toggle or motion control was amazing. Unfortunately, in New Leaf, the design making has been made Stylus only which is really disheartening. Regardless, none of these features really ruin the game for me. There’s just so much good in the game and it’s so much fun, that despite some frustrations I really love and enjoy the game and wholeheartedly recommend it to anyone who enjoys the series or similar games. You can also watch right here on Crystal Dreams!